I love country and pop music, including those instrumental music. Now I'm singing kids' favorite songs, Thai pop, Korean songs, or English songs with them. It's fun to be a part of kids' activities. I love taking pictures. A tiny snapshot camera is always with me, in my pocket. I love things in three, since I have triplets, I look for 3 in a row souvenir such as three owls bookmark I got from Osaka last year. I collect letter sets and bookmarks, both commercial and store bought. Now I start making my own postcards from the photographs I took. I'm eager to learn about how to make ATC, inchies, scrapbooks handmade postcards and related things. What I can do now is postcards from my photographs with some programs like photoscape and smilebox. I ALWAYS send swaps. Please message me if you have not received any swap from me. The postal service may have some mistakes. Things may get lost. I don't want it that way as I put much effort on every swap I chose, wrote on or packed. I will be happy to resend a swap if it does not arrive at your hands. I am not a cheater and never want to be cheated. After a nice period of time in the swap-bot community, I have been rated unfairly on a swap host in "Color White" swap. The worst is that my swap partner has been partially suspended, and I might not get my good rating back !! Another disappointment from one of my hard- working swap --> August Artifix Journal Mail Deadline: Sep 7, 2010 *** My sent Partner's account has been deleted. Comment: i changed this raring because i received it finally thank you it is lovely and cool. Comment: Send by date was the 16th July, but as of 5th August I've had nothing and heard nothing from yodnapa. Will change rating if I receive anything. Comment: send by date was the 16th July, still showing as unsent on 3rd Aug. Have sent message to yodnapa asking about it but no reply. Will change rating if I receive anything. Comment: Thank you so much for the great package!! Everything was great, but it was especially neat that you sent the Kawaii keychain as I went there last year and my souvenir keychain I got broke-now I have a new one!! Funny coincidence :) Thanks so much!!!! <3 <3 <3 <3 <3 !!! Comment: I received your second postcard. It was so nice from you that you resended it! Beautiful picture! Thank you! Comment: Sa wah dee ka and thank you so much for the postcard and stamp. It is very special because it has your triplets on it. Thank you for resending from June until July. Comment: Due to be sent by 21st June. I wrote to Yodnapa on the 6th July telling her I had not received. On the 10th she replied saying to wait a few more days. It should not take this long to get from Thailand to Australia. Wrote again on the 14th, telling her I had not received. still no reply. Comment: I LOVE the pc you sent me! The postage is so different and pretty! Comment: Thank you for the resend. The first one still has not arrived so I* imagine it is in the bottom of a mail bag somewhere. Comment: Love the PC and the quote. Thank you! Comment: Yes, men are a lot of trouble. Thank you for the postcard and stamp of Thailand. Sa was de kah to you and your family! It's all about disney ! 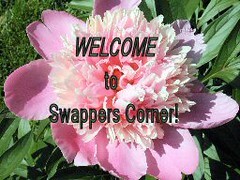 Welcome to the Swappers Corner group! Welcome to Newbie Journallers Group! Hi! You got me as your PC swap partner so I stopped by to see your profile. Your twins are so cute! How fun for you! Everything in 3...... I have never visited Thailand but my sister loves it! I have friends here who cook the best! I only like Chicken or beef Satay with peanut sauce made by my Thai friends-no other tastes as good! I would love a good peanut sauce recipe! Very nice profile and flickr!! Welcome and click to visit group.. It's not too late to join the Not Your Usual Postcards in an Envie swap! Oops, so sorry! Disregard the previous comment. I was confused! Just a reminder... the deadline for mailing the Quote Journal has passed.